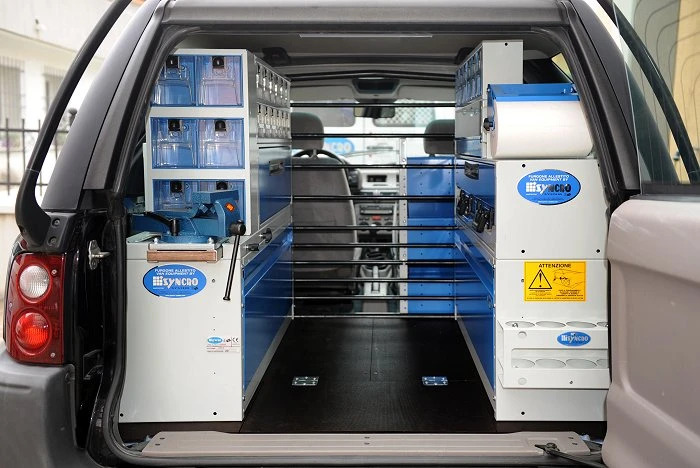 Syncro System upfits are usually done on traditional commercial vans of various models and makes. 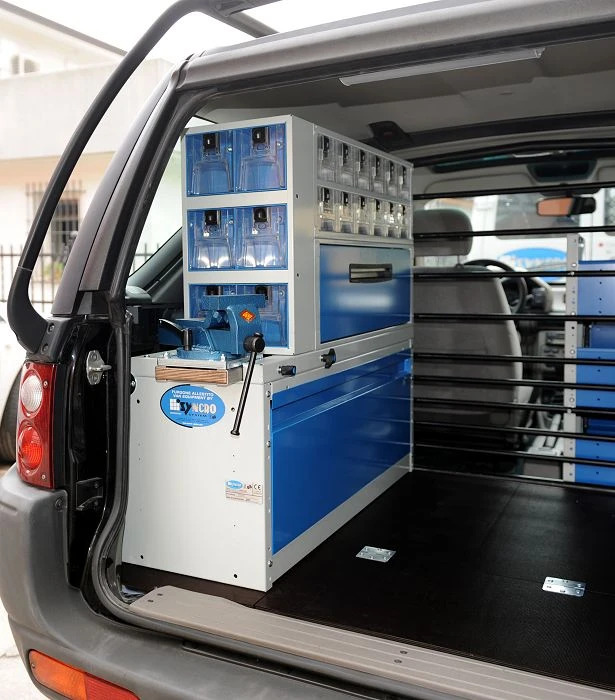 However, because of the versatility of the Syncro System modular components, upfits can be done on less traditional vehicles like the Land Rover Freelander (two passenger model) that can be seen in the photos on this page. We covered the floor of the cargo area with a 12 mm coated plywood floor panel. To be able to use the space under floor panel, we installed straps inserted through the plywood. 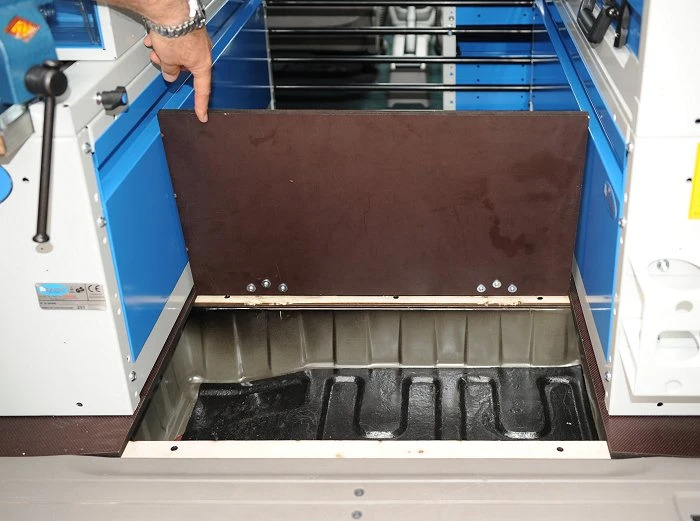 On the left side, we installed a wheel arch frame with hinged door, and above the base frame we added a vice with 115 mm jaws mounted to a small shelf that extracts out when needed. Over that, we mounted a Syncro drawer unit with a single large steel drawer (760 mm long and 200 mm tall) with ball-bearing glides on both sides. At the top of this particular modular system, we mounted a drawer unit with 12 clear plastic drawers – all with aluminum dividers and automatic locking button. On the left hand side, behind the vice, we mounted a second drawer unit with six forward-tilting clear plastic drawers, also with their own automatic locking buttons. On the right side of the van, there is another wheel arch frame with hinged door. 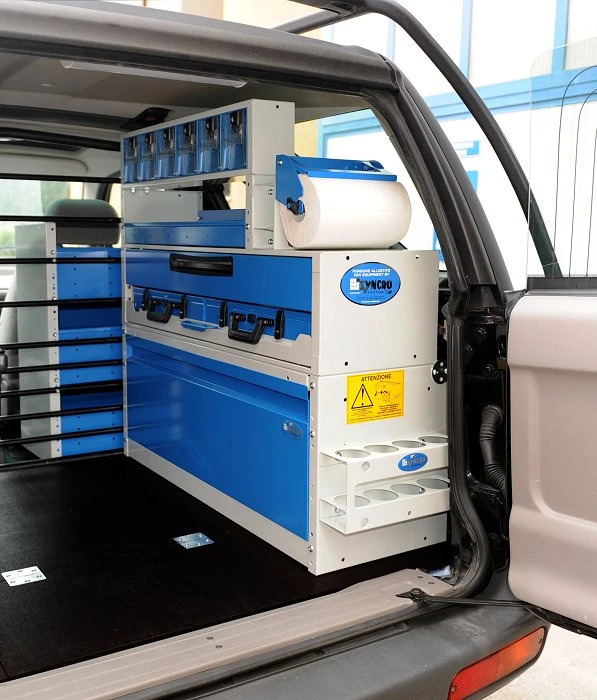 Above the frame is a drawer unit with a single steel drawer and a tray with portable utility case, complete with containers for screws, washers, bolts, and other small parts. Placed over the drawer unit is a single long shelf with metal dividers. Attached to the end panel is an aluminum spray can holder and a paper towel roll holder. On the top of the modular unit (on the right-hand side) is another drawer unit with forward-tilting clear plastic drawers – also with automatic locking buttons. To the side of the wheel arch frame (toward the back doors), we placed a second spray can holder. 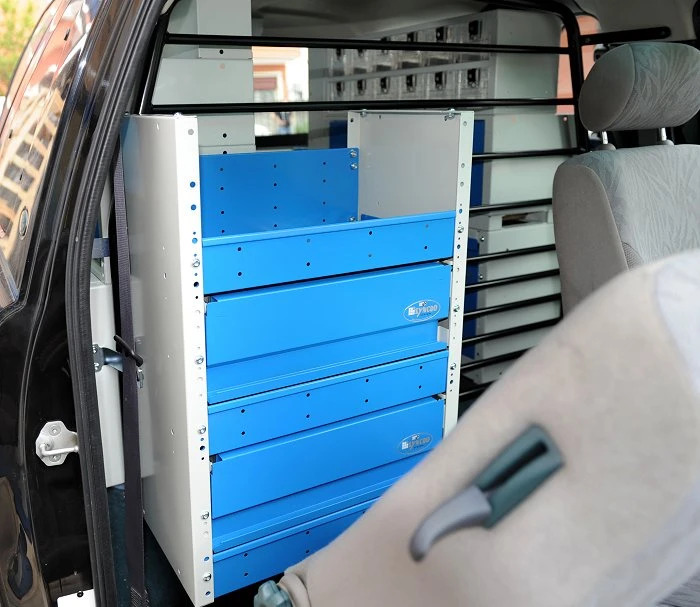 To optimize the available space, we positioned a shelving unit with three shelves (two with closing hinged doors) behind the passenger seat. To illuminate the cargo space, we used an 11-Watt neon light fixture powered by 12 volts, which we placed in the top at the back door.